That Goldilocks stamp just makes me smile! I colored her and her little bear buddy with Copics (even added some freckles with a black pen). I die cut the sentiment and put a bit of gold thread behind it (that's something I learned from my pal, Wida at Beachorado). BTW, the floral paper is something from Dear Lizzy that I've been hoarding forever. I colored Red with Copics (so much fun!) and I even gave her hood some cute little polka dots with a white pen. I love these open images! They are so much fun to color and paper piece! Here's a card I made using this new die set. There are actually 2 panels in this card, one with the sentiment and the other is the vellum layer. I used the arc/rounded die to create a round edge to the the honeycomb vellum layer. The card stock panel has the sentiment but it also hides where I attached the vellum panel. I really enjoy using these types of dies that allow you to do multiple techniques. They may not be the center of the design, but they really add to the overall effect. Thanks for checking out my peeks of these new sets! For fun, I'm giving away a set of the Red & Goldie (stamps and dies) and a set of the Custom Panels to 2 separate winners! A comment on this post gets you one chance to win and becoming a follower of the blog gets you 2 additional chances! I'll pick a winner Wednesday night (April 9th) at midnight and announce the winner first thing Thursday morning (April 10th, try to get it posted before everything goes live on the site). The new release will be available on Thursday, April 10th in the store. Be sure to come back on Thursday to hop with the entire DT gang featuring the entire May/June release:) There are lots more goodies to come! Love Red and Goldie, and love love love the custom panels dies! I love, love, love Red and Goldie! JJ you have some pretty awesome ideas!! What a great idea with the Custom Panets die set! Clever, clever, clever, JJ! That dies are such a must have! Love the customizing options. And the beyond cute stamp set? My dear, you have reasons to be a very proud mama!!! The Custom Panels die set is brilliant…. so many possibilities!! And Red and Goldie- the ca-utest stamps ever (love the sentiment cut outs!)! JJ for some reason I cannot see the photos of your projects. :( But your stamp set is oh-so-adorable, and the dies are brilliant - glad to see your question led to the creation of a great new product! OMG, JJ! These are AMAZING!!!! I can't believe your son drew these. WHAT? What amazing talent. And I have to have those custom panel dies for sure. Not even a question. lol oh pleeeeasssseeee let me win! Oh, and I'm now following your blog. I wasn't already? Crazy talk. Such a adorable stamp set!!! And the dies are amazing!!!! Thanks for the chance...I am a follower!!! I'm one of those people who have been wanting that die! I've searched high and low and couldn't find it until now. Thanks so much for creating it. It's going to be a must-have! Oh gosh these are just amazing! Can't wait to see what other ideas the DT comes up with! TFS! So so so so so so so cute!!!!!! Your red and goldie are SO CUTE. I didn't even read anything about who they were as soon as I saw the stamp set I knew it was red and goldie. Your die set is a fantastic idea. I totally get where you are coming from on the panel die. Sure, I can trim but many times they aren't perfect. I love the shapes you created in the center of the dies. They sure will come in handy and save me time. Ok those stamps are too cute and the panel dies are awesome!!! Congratulations!!! And so happy to already a follower! Woo hoo! I love both of these! The red and goldie set is so whimsical and cute - and the die set is awesome - I love that you put so many elements together in one set! Such a sweet stamp set and die! Love Red's freckles in the first card and her polka dots in the second. Those custom panel dies are a MUST HAVE! Why does April 10th seem so far away...lol. I'll be camping out to purchase them! Red and Goldie? How cute is that? What a fun collaboration with your son! And those dies are definitely a must have--thank you for designing them! Eeek, the little girls and critters are so cute, JJ!! Love your cards and new releases! Congrats on your new releases and thanks for the video - it really helped me to understand the custom panels - genius set!! Super cute stamp set! That die set is brilliant!!! cute! It would be perfect for me since I work in kindergarden :))) Love the card! Love this release from you! You thought of everything with the dies...the spacer is wonderful and LOVE Brady's illustrations! Happy Birthday friend!!! I'm totally in love with that little red girl. I'm so happy for you! oh wow...these are both absolute winners!!!! I think I'd use custom panels on every card - what a must have! I think the 'Custom Panels' Dies are the best thing since sliced bread!!! I love how you considered so many things when you created it, JJ! I've been wanting an A2 die for the longest time, and I love all the little geometric pieces you included with it...Thanks so much for thinking of every, little detail when you created these sets...I love them all, and I'm thrilled that you included a 'spacer'...Genius idea! I love how you colored those adorable images on your 'Red and Goldie' cards...so sweet and right up my alley! Your rose card is also stunning! Such a fun idea to create the vellum panel with the hexies and the rounded die...wow! Sorry for the longest post in the history of blogging...I couldn't contain my excitement!!! Wow!!! Wow!! Wow!! I love the rectangle die! There have been so many time when i could use one with pattern paper or scraps!! And the little girls are sooo cut! Oh and Happy Birthday!! Those Avery Elle dies and stamps are just fabulous! Super cute stamp and love the die set. Custom panels are a great idea and that spacer - wow… You are so talented. I already follow your blog via email as I love your style!! Congrats on your new release. Hope they run off the shelf!! Woohoo! Fun set, great dies, and awesome video! Woot! Woot! You go girl! Love this new stamp and die sets! OMG! Goldielocks and Red Riding Hood! Too stinkin cute! The Custom Panels die set is amazing and I must have it! Congrats my friend! The expressions are just THE best! LOL! Oh, yeah, already a follower! The Custom Panels are brilliant. I already follow you on Bloglovin. J J, you have thought out a lot of possibilities with this set...how awesome! Congrats on designing this fabulous stamp set and die cut! 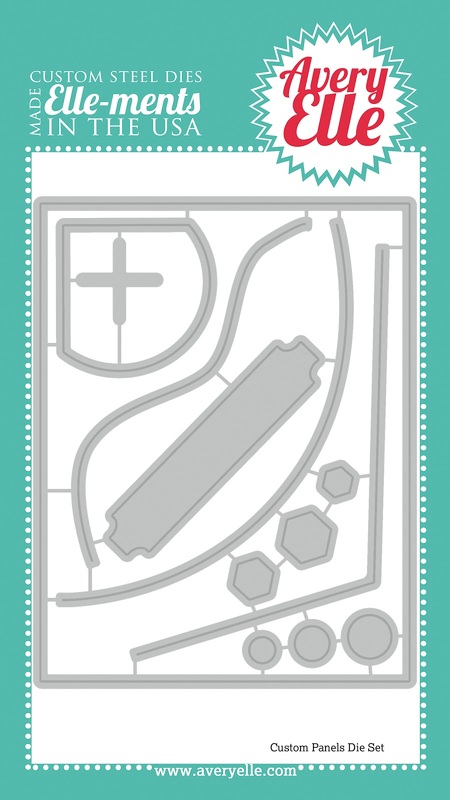 ( in fact, last night I was making a card and this die cut set would really come in handy...)! The custom panels are fantastic! I had the same problem not too long ago, and now there's a solution! The Custom Panel dies are genius! I already follow your blog via Feedly. Oh my world...Red and Goldie are simply tooo cute! Absolutely in love with their little faces. These look fantastic and absolutely love the Custom Panels set, it can be used for so many different things!! Thanks so much for the chance to win!! I love your new die set!! Looks totally cool and versatile! I follow your blog and love everything you make! These new sets are great! Love the dies to cut panels!! Fabulous!!! What great new sets! Thank you for sharing the inspiration for your products. It is fun to know how and why they came into being. Very cute fairy tale set and love the versatile dies. I love it all, JJ!!!! Really cute stamps/dies. Thank for the chance to win. Ahhh JJ - you are so sweet! Thanks for the shout out! XOXO! Love the Fairy Tale stamps & dies...just adorable. Thanks for the opportunity to win. Both the stamps and dies look awesome! Thanks for the chance to win! I just love things that makes life easier for a card maker. Especially mine!! Thanks! I love this! I can't wait for release day! Love the new stamps and esp. The new dies. I love these new products! The stamps are so darn cute and the dies are genius! Thanks to you and your son for coming up with all this awesomeness and for such a great giveaway! Just added myself as a follower! Love the new stamps and dies! The custom panel die is Brilliant and the stamp set is super cute too. Love the new stamps and dies! Custom Panels looks amazing!!! Very creative die set, love the Custom Panel dies! Really enjoyed your video, showing how some of the pieces work together, and the cross spacer is brilliant! OH, these are so sweet. Love those dies and that Little Red Riding Hood is the cutest! Love the stamp & die sets. The Custom Panel dies look really useful and they are definitely on my wishlist! The stamp set is really cute, too! I'm a follower of your blog too. I especially love that your son helped you out with the set. I follow your blog by email and Google Friend. So many possibilities with this die set. Yeah, the dies are just lovely. I must have them. And the "happy birthday" .... i like that toooooo. Wow what a great idea and help us go faster and make more cards ;-) The stamp set is so cute too !!! Thanks for the chance to win !! Such a cute stamp set and the possibilities are endless with the dies! Love them! love the stamp set!! and the dies will be very handy when working on cards!! Congratulations on your new sets coming out! They are so pretty! Thanks! Love Red & Goldi ~Such cute images! Really like the sentiment font how they look die cut! I just got my first die cutting machine yesterday (a big shot) and I love these dies!! Thanks for the chance! Such cute dies and stamps!!! Would love to win this!! Red & Goldie (and their little friends!) and the Custom Panels are wonderful! Love all the details you've packed into these sets. I am a follower and love that Custom panel die set! Thank you for the chance to win it! Yes… I am already a devoted follower! The Red and Goldie set is adorable but I love the custom panels dies. the card you made with the round edge is beautiful! Awesome!!! I love them both JJ! I'd love to win! Thx for the chance! Such cuteness and adorable cards! Pretty floral card too! following! Thanks for the video! Red and Goldie is just adorable! And I am loving that die set! So versatile! Following you now, although I'm not sure how I wasn't before as I've been hanging around here quite often! I love those fairy tale characters, so fun and cute! Great cards! Thanks for the chance to win! These stamps and dies are awesome! Love the cards you've created! What sweet stamps! I've just become a follower of your blog and am keeping my fingers crossed! Love the Custom Panels die set. Your cards are beautiful. Thanks for sharing and for the chance to win. 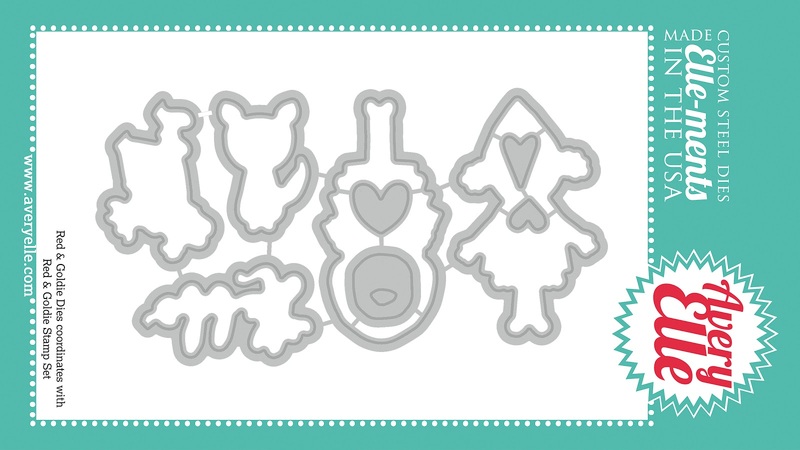 the stamps are super cute, and those dies are definitely must have basics-congrats!!! Love, love, love the Red & Goldie set. Too cute & it's great to have matching dies for them. Looks like a really fun release. Thanks. Wow looking great and the cards are beautiful great stamps and coordinating dies. Great release thanks for sharing and the chance to win. Became a follower. I am in love with these new stamp and die sets! Too too cute! Your son must be so talented and obviously so are you. 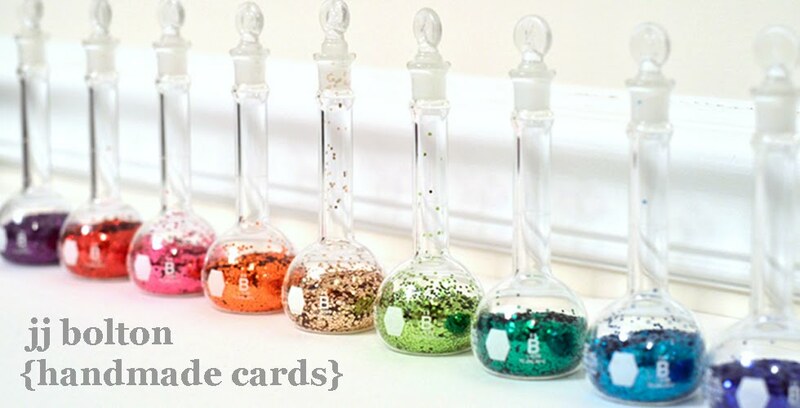 Your cards turned out adorable. I have been wanting a die set like this to come out since...forever! Must get this right now! Love love the new dies and stamps sets!! Definitely a must have!! Wow, love the new dies! Look fun to use and switch up your cards. Wow! Absolutely gorgeous projects. I love the second! The first is just adorable. That goldilocks set is so cute! Beautiful! I love the pop of color on the floral thank you card. And those dies are incredible! Love love love the Custom Panels dies! So versatile! I've been following your blog for awhile now & never knew you designed stamps! Wow, that's impressive! And they're so cute! I like the card die set also because I forget I can make cards with different-shaped panels! Love these, the possibilities are endless. My mind is already designing cards and pages using them!!! 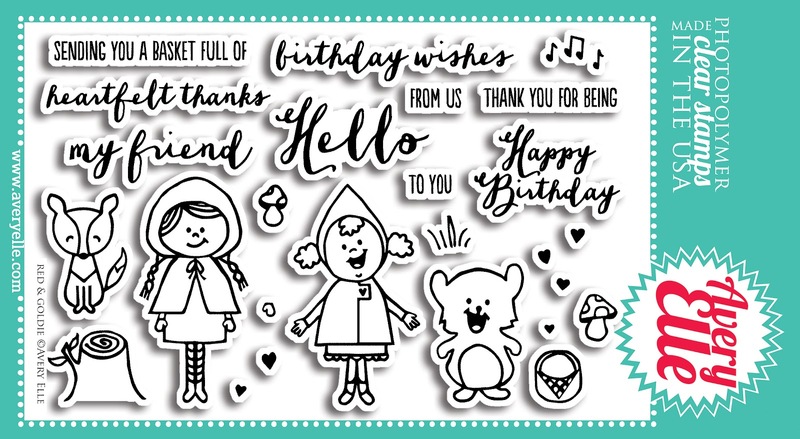 Such cute cards and what fun Avery Elle stamps! Saw these on AE's blog today. Was drooling over them. Love what you did with them. Especially glad to see Elle-ments A2 die. YAY! Oh gosh, the Red and Goldie stamp set is just darling! And I can think of a million uses for the Custom Panels die set! Thanks for the chance to win them! Wow are these ever cute! I love your Red all colored up with her freckled face. That bloom is gorgeous too! Becoming totally addicted to AE - ps your video was excellent. Oooh, dies! LOVE DIES!! Thanks for the chance! Love the stamp sets and your cards! Love the sets and the dies are genius!! Love the new stuff! You mention Heather Campbell's Blog but I have googled and can't find the address for her blog can you share it with me/us? the gold is stunning. Thanks for inspiring! What a great concept. I like the panel and the additional edge dies are brilliant. great cards ! Thanks for the video ! How great. Thanks for a chance to win too! love this die set. so many possibilities! hope to win!